In September 1994, the faculty was renamed into the faculty of “Information Technologies” and headed by its candidate of physical and mathematical sciences, associate professor ZhanibekovM.Zh. In September 1997, based on this faculty, a new faculty of International Relations was established, which was separated by the candidate of philology, associate professor Tagayev M.J. Faculty of Fundamental and Vocational Education, which was dissolved in the same year. At the initiative of the candidate of technical sciences, associate professor, professor OshTU Attokurov Urmat Tologonovich, by the decree of the rector No. 09-04 / 325 of December 23, 2003, the Engineering and Pedagogical Faculty was established. By the order of the rector № 09-04 / 43 from 03.03.2009 the faculty was renamed into the Natural – Technical Faculty. From December 2003 to 2010 the faculty was headed by Candidate of Technical Sciences, docent, Prof. of OshTU Attokurov U.T. From 2010 to the present time, the Natural and Technical Faculty is headed by Adilkan Azimzhanovich Sarimsakov, Candidate of Technical Sciences, Professor of OshTU. At the faculty there are: a scientific council, a method council, a women’s council, a student senate and a trade union organization; 62 TS (teaching staff) and SP ( training supporting personnel) work, including: 4 Doctors of Sciences, 19 Candidates of Sciences. The faculty conducts research work in accordance with the general theme, the work plan of each department. Scientific-research work of the faculty is carried out at the proper level. Head of the Department “Applied Mathematics” AshirbaevaA.Zh. successfully defended a doctor’s degree in physics and mathematics and received a Diploma of Doctor of Sciences. Professor of the Department of Informatics Attokurov U.T. e was elected Corresponding Member of the Academy of Engineering of the Kyrgyz Republic. The following teachers of the departments completed their scientific works and successfully defended their thesis: art. prep. Chair of TVE – Kasymbekov EA, Art. prep. Department of PM Zulpukarov Zh.A. and Mamaziava E.A., art. prep. Department of Informatics Mamatkasymova A. and Saadalov T.Y. – Physics of solid state radiation. First-year students took third place in the Olympics between the first courses of OshTU. The team of KVN NNF was awarded with the second degree diploma. The team “Phoenix” received a diploma I degree for the best game in the KVN, organized by the Youth Committee and the Women’s Council of OshTU. A student of the PMI-12 Borkoshova Munara won the II place in the Miss OshTU competition. Teacher of the department “Physics” Madanbekova Jyldyzkan was awarded a diploma in the nomination “Best Teacher of the Year” OshTU. Head of the Department “Applied Mathematics” Ashirbayeva Ajarkarkin was awarded a diploma in the nomination “Best scientific work of the year”. – 550600 – “Arteducation” (bachelor). Dean of the Faculty, candidate og technical sciences, docent, Professor of OshTU Sarimsakov A.A.
358 students are studying at the faculty, including: on full-time education 97 students on a budgetary basis, 161 students on a contract basis, 100 students on a distance basis. The physics department was founded in 1974, when the Physics and Mathematics Sector was established at the Frunze Polytechnic Institute based on the Osh General Technical Faculty. In 1994 the department “Physics” was created. The Department of Physics is one of the first established departments, and on the way of its development it constantly contributes to the training of professional specialists. The department prepared and conducted several scientific conferences of national and international scale. Academician of the Scientific Academy of New York USA, Academician Maripov AM; as well as professors Tashbolotov IT, Ismanzhanov AI; associate professors Turumbekov AT, Arziev Zh.A., Kurmankulov Sh.Zh., Papiev MP, Asanov MA and others, which still provide great scientific and methodological assistance. -1980-86. Academician of the National Academy of Sciences of the Kyrgyz Republic Tekenov Zh.T. 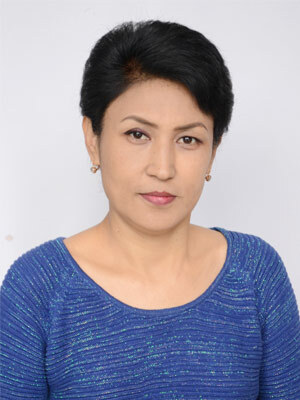 Since 2005 to the present time graduate and post-graduate student of OshTU University, candidate of technical sciences, prof. OshTU Satybaldiev A.B., heads the department. – Radiation physics of solids. The chair conducts methodical and scientific seminars on which materials of the scientific and methodical direction are discussed. Work is underway on a grant announced by the Ministry of Education and Science. Also at the department there was organized a circle “Physicist-technician”. Students working in the circle created working models, which took prizes in various competitions. Students, prepared by physics teachers, in the last five years occupy in physics prizes in regional Olympiads. Current position: Professor. physicist, pro-rector in the state language. Scientific degree: Candidate of Physical and Mathematical SciencesAcademic title: docent , Professor of OshTU. Specialty, position: Physics, additional mathematics; Head of the Department of Informatization and Innovative Technologies of OshTU, docent of OshTU. Teaching disciplines: “General Physics Course”, “Thermophysics”. mob. 0 (0773) 10 92 32. The mission of the department is the preparation of highly qualified specialists in demand on the labor market, corresponding to the professional competencies of the domestic and world level, creating conditions for students to master state educational standards and to obtain practical skills necessary for them in the future profession. development of the educational and methodological base of higher professional education: continuation of work on the creation of educational and methodical complexes of the second and third generations, teaching aids, textbooks, lecture notes on the disciplines of the department for full-time and distant students. Work on the creation of didactic materials, test assignments for all disciplines in accordance with the state standard. creation of prerequisites for raising the scientific and pedagogical qualifications of the teachers of the department through postgraduate study, doctoral studies and competition. conducting activities to manage the quality of education: the development of criteria for assessing the quality of teaching and learning in psychological and pedagogical disciplines; strengthening the quality of professional training of scientific and scientific and pedagogical personnel. Creation of conditions for self-development of the creative individuality of teachers and students. providing scientific and methodological assistance to educational institutions in Osh and Osh region. expansion of the subject of final qualification and coursework, most relevant for the region; the practice of inviting representatives of organizations and enterprises to select graduates to attend the meetings of the certification commissions. joint research work of teachers and students within the framework of course and diploma design, the organization of psychological and pedagogical research in the course of pedagogical practices in institutions of SPT. development of measures to attract students to scientific research. participation of the members of the department in scientific and practical conferences and methodological seminars (publications on the results of scientific research work). Polytechnic education and general technical training are two leading concepts, with the help of which a description of the process of the formation of a person capable of highly productive work in the conditions of continuously changing equipment and technology is being conducted. This is greatly facilitated by the preparation of students in primary and secondary vocational education. The need for specialists “Teacher of professional training” is quite large. In primary and secondary special educational institutions special technical disciplines are taught by engineers who do not have a special pedagogical education. In addition, it should be noted that in recent years there has been an outflow of qualified teachers from the vocational education system to the sphere of small and medium-sized businesses due to low pay. A very important role in the process of training highly qualified personnel is played by the availability of a highly qualified teaching staff of the vocational education of the republic. Before the vocational education is the problem of training teachers of a new generation, retraining and upgrading the skills of working teachers. In the conditions of economic reform, there is a sharp shortage of specialists (professionals) in vocational education teachers. Osh technological university named after M.M. Adysheva, carrying out the national program “Education”, the law on education, the program “Personnel of the 21st Century” in the process of work, and taking into account the need for specialists in the above-mentioned specialty in the southern region (Osh, Jalal-Abad, Batken regions), makes every effort in training highly qualified personnel. To provide the appropriate number of specialists in the direction 558300 ” Professional training” (by industry) and specialty 570021 “I and E” in OshTU requires a set of students in this specialty for 25 places annually, including 15 places for budgetary training. The material base was: 2 training workshops, auto class, 6 laboratories. The sector was headed by a freelance automotive club at the disposal of which there were 3 motor vehicles. There were courses of drivers and motorcyclists. In August 1989, by order of the Minister of Public Education of the Kyrghyz SSR, the specialty “General technical disciplines and work” (full-time and part-time forms of training, with a five-year training term) is transferred to the Osh Faculty of the FPI. The faculty, faculty, teaching and support staff, 250 full-time students and 56 students in correspondence courses were transferred. In 1990, the department was renamed to the department “Methodology of labor training”, then in 1991 to the department “Labor training”. In 2003 the department “Vocational training” was renamed into the department “Engineering pedagogy”. And in 2008 the department was renamed into the department “Technology of professional training”. Currently, the department has two centers: the Center for Innovative technology of education and the professional training of skilled workers and the upgrading of skills of workers who have received licenses from the Ministry of Education. In 1995, the department was headed by candidate of pedagogical science., docent Saitov DS. In 2001 – candidate of technical sciences, docent Attokurov U.T. From 2004 to 2008, the department of «Engineering Pedagogy» was headed by candidate of chemical sciences, docent Zholdoshov BM. From 2008 to the present time, the chair of “TPT” is headed by candidate of physic-mathematical science, docent Aldashov M.K. Currently, 3 docents, 2 senior teachers, 2 teachers, 1 training master, 2 laboratory assistants work at the department. The designer of the environment is a profession whose essence is creative activity aimed at creating the aesthetically organized closest subject-spatial environment of a person – interiors, their decoration, equipment, furniture, as well as artistic works of decorative art. This specialty covers simultaneously such adjacent areas of artistic creativity and technologies as architecture and engineering knowledge, design and decorative and applied arts, at the junction of which creative activity of design artists takes place. Classrooms in psychology and pedagogy (2/110), on methodology and technology of education (2/126) are equipped with visual aids, tablets on all topics. There is a methodical room (2/127), provided with psychological and pedagogical literature. At the department there are centers: the professional training of skilled workers and the upgrading of skills of working cadres, as well as a course of continuing education for teachers of schools in pedagogy, psychology and teaching methods. a) Designing of modern technology of education in higher education. b) Research of the problem “Pedagogical bases of development of professionalism of the engineer-teacher in the system of university training”. c) Research of the problem “Dynamic superplasticity of structural steels”. The department is graduating 550800 “Professional training” for students (by branches) and specialty 570021 “Tools and equipment” for undergraduate students. The faculty of the department conducts lectures at full-time and distant departments of the university, educational-methodical, scientific-research and educational work. The educational process at the department is carried out according to the curricula in the direction of “PT” and “I &E” in accordance with educational standards. Work programs of the academic disciplines are systematically processed and improved every year. Work programs take into account the planning of topics for individual classes and assignments for independent work of students. The teachers of the department are on duty for individual consultations. Group consultations are organized according to the schedule of the exam and examination session. The quality control of the classes is carried out by mutual visits of the teachers of the teaching staff at the department, which is discussed at the meetings of the department and recorded in the journal. There is a corner for the implementation of tests and CSIW for students of distant forms of teaching disciplines of the department. Educational – methodical work of the department. A significant work has been done at the department to improve the teaching and methodological provision of the disciplines assigned to the department. Work programs of disciplines are developed on the basis of standard curricula and approved by the educational and methodological council of the faculty. The faculty of the department constantly works on the replenishment and improvement of the existing teaching and methodological literature, methodological guides and methodological instructions for students. At the same time, great importance is being paid to raising the level of methodological instructions and other educational and methodological materials for conducting lectures, laboratory, practical classes and performing coursework. Based on the purposeful educational and methodological work at the department, certain results were achieved, in particular, on the basis of the use of Internet resources. center for Innovative Learning Technology. A modern cabinet of “Methodology and technology of education” was created at the department. The cabinet is equipped with the latest technical means. Research work of the department. Designing of modern technologies of education in higher education. Scientific and pedagogical foundations in the formation of professional competencies and personal qualities of engineers and educators. can.ph-m.s, docent Aldashov M.K- “01.02.04 -” Dynamic superplasticity of structural steels “. Applicants work at the department: senior teacher Mashaev MA, senior teacher Mamatova M.Zh., teacher Alieva R.A. The department conducts scientific and methodological seminars, courses to improve the qualifications of teachers of OshTU. Teachers of the department actively engaged with students in the scientific research and scientific and methodical plan, the result of which is participation in scientific and practical conferences, in olympiads and competitions. Teaching disciplines: Engineering Psychology, General and Professional Pedagogy, Pedagogical Technologies, Innovative Technologies in Education, Fundamentals of Pedagogical Excellence, Social Psychology, Psychology of Management and Communication. The department “Higher Mathematics” was formulated by the order of the rector of the Osh Technological College (OshTC) of March 7, 1991. The head of the department was appointed candidate of physical-mathematical science, docentTashbaeva AM. In July 1994, the department of “Higher Mathematics” was divided into two departments by the order of the rector: “Higher Mathematics” and “Applied Mathematics”, the head of the new department was appointed candidate of physical-mathematical science, docent Djuraev AM. In 1998, the department “Applied Mathematics” separated the department “Mathematical Methods in Economics” and the head of this department was appointed candidate of physical-mathematical science, docentKultayev T.Ch. The Chair of “Higher Mathematics” was in charge of: from 1996 to 1997. 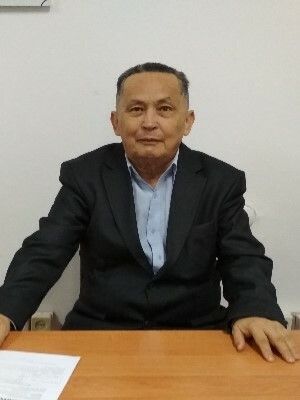 – Doctor of physical and mathematical sciences, professor Ashbaev AA; from 1998 to 2003 – doctor of physical and mathematical sciences, professor SatarovZh.S . ; from 2004-2007 – candidate of physical-mathematical science, docentAshirbaevaA.Zh. In 2006, the department “Higher Mathematics” was recognized as the “Best Chair of Oshtu” and awarded a diploma of the I degree. The Department of Applied Mathematics was in charge of: in 2001-2006. candidate of physical-mathematical science, docentTurumbekov AT; 2006-2007 Doctor of physical and mathematical sciences, professor A.Ashbaev. November 5, 2007 on the basis of the decision of the Academic council of the OshTU named after M.M. Adyshev issued an order of the rector “On the merger of the two departments” Higher Mathematics “and” Applied Mathematics “at the Department of Applied Mathematics. Since the moment of unification and up to the present time the department is headed by candidate of physical-mathematical science, professor AshirbaevaA.Zh. In 2011, the department “Applied Mathematics” became the winner of the contest in the nomination “The best department of OshTU”. Currently, the department serves 6 mathematical faculties in OshTU and, on the basis of the Faculty of Natural Sciences, prepares bachelors and masters in the direction “510200 Applied Mathematics and Informatics”. Investigation of solutions of nonlinear integro-differential equations and systems of partial differential equations by the method of an additional argument. Generating elements and defining relations in linear groups. Regularization and uniqueness of the solution of integral equations of Fredholm and Volterra. AshirbaevaA.Zh. Solutions of non-linear differential and integro-differential partial differential equations of high order by the method of an additional argument. – Bishkek: Ilim, 2013. – 134 p.
Zhusupbaev A., AshirbaevaA.Zh. Mamatkadyrova G. Economics of the operation of the lord research method of the Jordan model. Teaching aid .// Publishing House Gulchynar, Bishkek, 2008. – 336b. AshirbaevaA.Zh., Mamaziyeva E.A. Operational calculus. Fundamentals of probability theory and mathematical statistics.Teaching-methodical manual. // Oshtu Publishing House, Osh, 2017. Saparova G.B. Methodical instructions for the discipline “Computational Mathematics” (for practical and laboratory studies) // OshTU Publishing House, Osh, 2017. ZulpukarovZh.A., Kakanbaev NI, MambetovZh.I.Triple integrals // Publishing house OshTU, Osh, 2013. V Congress of Mathematicians of Turkic-speaking countries, Kyrgyzstan, Bulan-Sogott. 5-7 June 2014. II International Scientific Conference “Actual problems of the theory of control, topology and operator equations”, dedicated to the 20th anniversary of the formation of the Kyrgyz-Russian Slavonic University (KRSU) them. the first president BN. Yeltsin and the 100th anniversary of the founder of the mathematical scientific school of the Kirghiz Soviet Socialist Republic YakovVasilievichBykov. September 5-7, 2013. VI Congress of the Mathematical Society of Turkic-speaking Countries “, Kazakhstan, Astana, 2-5 October, 2017.
International conference dedicated to the 80th anniversary of the birth of Academician Mikhail Mikhailovich Lavrentiev “Inverse and ill-posed problems of mathematical physics”. Novosibirsk, Russia. 5-12-August 2012goda. International scientific and practical conference “Innovation-2016”. Uzbekistan, Tashkent. 5-10 October 2016. History of the department “Informatics” By order of the Rector of the FAI from March 6, 1990, the department of «Electronics and Computing Machinery» was founded on the basis of the Osh evening faculty of the Frunze Polytechnic Institute, which was headed by senior teacher A. A. Sarimsakov. September 9, 1997, the department was renamed the Department of «Informatics and Computing Engineering» and the department was headed by candidate of pedagogical sciences, docent Nazarov MN. In 2000, the departments “General Informatics” and “Computer Science” were created based on the “Informatics and Computing Equipment” department. At this time candidate of pedagogical sciences, docent Turgunbaev S.T., headed the department. On April 24, 2003 the department was renamed the department of Informatics. Candidate of pedagogical sciences, docent Nazarov MN, assigned to the head of the department. From September 1, 2006 to February 2007, the department headed by senior teacher Saadalov T.Y. From 2007 to 2010 the department was headed candidate of technical science, professor Sarimsakov A.A. Since October 2010 the department is headed by candidate of pedagogical sciences , docent Matisakov Zh.K. At present time, there are 1 doctor of technical sciences, 4 candidate of technical sciences, 2 candidate of physic-mathematic science, 3 professors, 4 docents, 4 senior teacher, 3 teachers, 2 engineer-programmer, 1 electronics engineer and 2 laboratory assistants. The department has 1 lecture hall, 4 computer classes. The “Informatics” department is the issuing department of bachelors and masters in the direction 710300 “Applied Informatics in the information sphere”. The experience of leading universities showed that bachelors and masters in the direction 710300 “Applied Informatics in the information sphere” successfully work in the field of education, economics, sociology, medicine, information networks, system and applied programming and other fields. development of purposefulness, organization, citizenship, communicative, tolerance, increase of their general culture among students. the formation of skills for working with relevant tools in the professional field. ensuring the quality of automation and informatization of solutions to applied problems and the creation of IS. programming, testing and documenting applications. maintenance and operation of IS. evaluation of costs and reliability of design solutions. preparation of reviews, annotations, drawing up abstracts, scientific reports, publications and bibliographies on scientific research in the field of applied informatics. The department of «Applied Informatics» has modern lecture halls, an electronic library, well-equipped computer classes connected to the Internet. The department of «Applied Informatics» focuses the educational and scientific interests of graduates on their practical activities in the real sector of the economy. Passage by students of practice is organized at enterprises and organizations that most widely use modern computer and telecommunication technologies in basic production processes. With the participation of the department, agreements on social and economic partnership with municipal entities of the Rostov region have been concluded, which allow the participation of the department and students in solving specific technical problems of service enterprises and municipal services. The knowledge and practical skills of graduates of the direction “Applied Informatics” are sufficient for job placement and stable career growth. Teaching disciplines: “Administration of ICEandST”, “Electronics and computer architecture”. Teaching disciplines: “Computing machine SSiT”, “Basics of informatics”, “Multimedia and technology system”, “Distributed object technologies”. Teaching disciplines: “Algorithms and data structures”, “Intellectual analysis and data storage”. By order of the Ministry of Public Education of 07.06.1971 based on the Osh evening faculty of the Frunze Polytechnic Institute, the Department of Social Sciences and Languages ​​was opened. In 1990, the Department of Social Sciences and Languages ​​will be renamed the Department of Sociology and Humanitarian Education. From this department the following departments are separated: “Physical education”, “Linguistics”, “Marketing and economic theory”. In 1994, based on the standard of the Ministry of Science and the formation of the KR, the department will be renamed the Department of Philosophy and Social Sciences. In 2002, the department “History” and “Philosophy” together form the chair of “Social Sciences” based on the evening faculty. At the department worked: Kurmanbaeva R, Assoc. Candidate of Economic Sciences, Assoc. Toktosunova AI, Assoc. Ph.D. Zulpukarov A.I. TekenevaS.Zh. – candidate of historical sciences. 2002 ErgeshbaevaR.Zh. – Candidate of Philosophy. In order to increase the educational and research work at the department, theoretical and methodological seminars are held monthly. Teachers improve their qualifications through internships, special training and postgraduate studies. In the 1993-94 school year, a four-month course was opened for teachers at the department to prepare and pass the candidate’s minimum in philosophy. Since 2001, the club has operated “Rukhaniyat” and “Kaganat” clubs. To date, the department employs 1 professor, 1 doctor of science, 5 associate professors, 1 senior teacher and 1 senior specialist. Teaching and teaching auxiliary staff of the Department of Social Sciences. Mamytov U.Zh. , docent of 2009, NAS of the KR, defended his thesis on the topic “Kyrgyz-Kazakh relations in the post-Soviet period (Political and economic aspect).” Scientific adviser, doctor of historical sciences, professor DzhumanalievA.Zh. Nurunbetov BA – doctor of history, professor of 2000 NAS of the KR, defended his doctoral dissertation on the topic “Social status of the working class”, scientific adviser d.i.n., prof. DjumanalievZh. Tobalkov Ch.B.- Candidate of Sciences, Associate Professor Osh TU 2010, defended his thesis on the theme “Kyrgyz-Uzbek relations”. 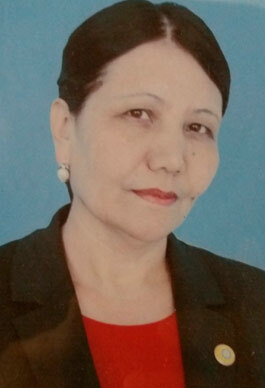 The scientific adviser is Doctor of Historical Sciences, Professor Jumanaliev J.
Abdyrazakova Z.M. – Ph.D., Associate Professor Osh TU 2010, defended his thesis on the topic “International attitude of sovereign Kyrgyzstan with the European Union”. 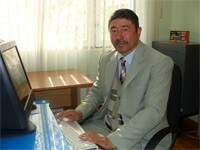 The scientific adviser is Doctor of Science, prof. Djumanaliev Zh. “Methods of teaching the project”, “Bagyt KG” Certificate January 2017. STLI project “Family” on the topics “Violence against women, conflict, emotional health, a healthy family” Osh TU 2017. Osh rifle “Professional” the educational center, computer course 2014. USAID and ACTED at the training on the early warning system. Osh 2012. “El Baaths” accreditation of the agent “Organization of non-traditional assessments and reporting”. Osh 2018. Nurunbetov Baltagul Attokurovich (0770 22 21 57) bnurunbetov@mail.ru. Teacher of History and Humanities, docent. Methods of teaching the project, “Bagyt KG” Certificate January 2017. STLI project “Family” on the topics “Violence against women, conflict, emotional health, healthy family” Osh TU 2017. Osh rifle “Professional” educational center, computer course 2014. USAID and ACTED at the training on the Early Warning System Osh 2012. Osh rifle “Professional” educational center, computer course 2014-zhyl. “El Baaths” accreditation of the agent “Organization of non-traditional assessments and reporting”. Otambaev Tariel Akbaralievich (0778 64 67 09), (0558 53 53 26) Otambaev@mail.ru. Russian Federation “Innovative Technologies for Higher Education Programs” Moscow RGSU 2017. Russian Federation “Actual issues and organization of training sessions in higher education and methods of teaching the discipline” Philosophy “” Moscow, RSSU 2017. Tobocalov Cholponbai Bazarbaevich (0555 82 34 89), (0708 60 80 54) tobakalov70@bk.ru. Philosophy, history of Kyrgyzstan, religious studies.